While in Canberra for the NSW Masters Short Course Swimming Championships, we took time out from our training schedule to visit some of the natural and cultural attractions of Canberra and the surrounding area. The experience exceeded our expectations by a large amount - what a great place! There is much to see and do. Presentation standards are very high, as is the quality of the food at the various venues and cafes. There is also much of interest to photograph. Here follows a selection. Enjoy. Charles Bean, Australia's official World War I historian, first conceived a museum memorial to Australian soldiers while observing the 1916 battles in France. The Australian War Records Section was established in May 1917 to ensure preservation of records relating to the war being fought at the time. Records and relics were exhibited first in Melbourne and later in Canberra. An architecture competition for a building to house the memorial occurred in 1927 but a limited budget and the effects of the Depression meant that the project was not completed until 14 years later. The building was officially opened on 11 November 1941 by the then Governor-General Lord Gowrie, a former soldier whose honours included the Victoria Cross. Additions since the 1940s have allowed Australia's participation in all recent conflicts to be displayed. 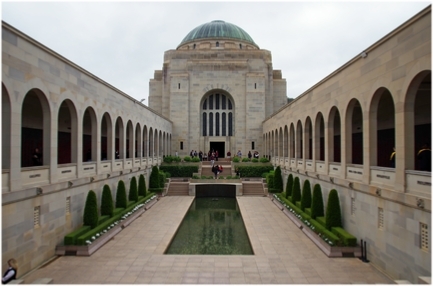 The Tomb of the Unknown Australian Soldier was added in 1993, to mark the 75th anniversary of the end of World War I. Right: widely regarded as one of the most significant memorials of its type in the world. Left: Commemorative Area, with Hall of Memory under the dome. 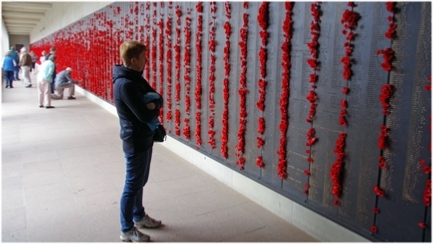 Bottom left: some of the 102,000 who have given their lives in the service of Australia. The panels are located under the archways in the photo at left. 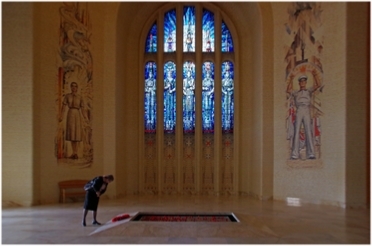 Right: Hall of Memory with symbolic imagery from World War II and the tomb of the Unknown Australian Soldier. 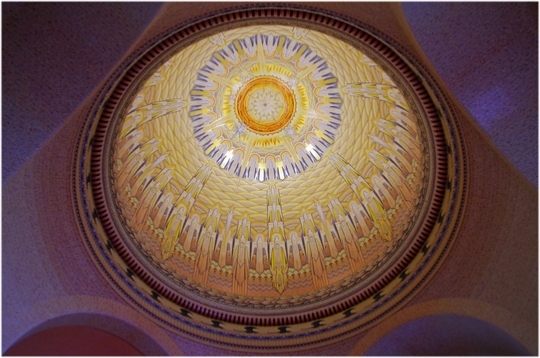 Bottom right: ornate ceiling of the Hall of Memory.